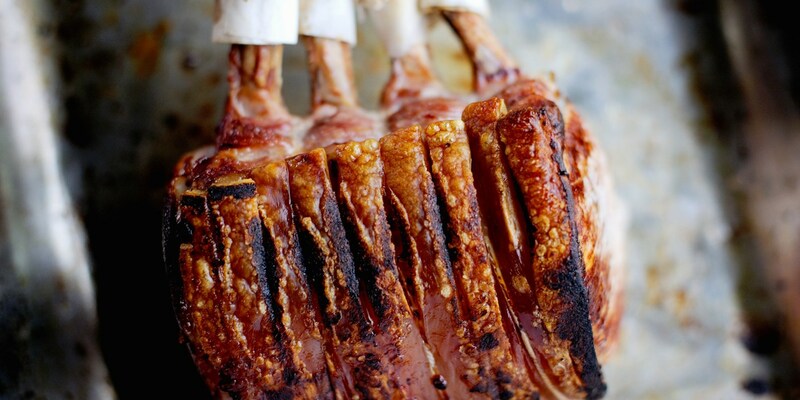 Fatty, rich and full of flavour, pork is a popular meat in cultures around the world. Many countries across Europe and beyond have their own charcuterie traditions, while elsewhere the meat is roasted, barbecued and fried and served with a variety of accompaniments. In the UK we are used to seeing pork in a myriad different forms, from juicy belly and chops to cheaper preparations such as sausage, bacon, black pudding and ham. Whatever cut you’re working with, this collection of pork recipes contains some fantastic inspiration for working with porcine produce. Pairing well with apple and earthy root vegetables, pork is an excellent meat to use in autumnal dishes. Richard Davies serves baked apple and celeriac purée with his Pork belly recipe, while Josh Eggleton’s Pork shoulder with bubble and squeak is a wonderfully simple pulled pork recipe, ideal for an autumn supper. When the weather gets warmer and a lighter Sunday lunch is preferable try Graham Campbell's lovely seasonal Herb-stuffed pork loin recipe, served with spring greens and Jersey Royals. For the perfect snack for long evenings sat outside with a drink, Richard Davies offers a take on one of pork’s best loved incarnations - Pork scratchings. There are also plenty of unusual pork recipes in this collection, great for wowing guests and experimenting with new cuts and preparations. Matt Gillan’s striking Braised pig’s head recipe and Paul Foster’s Pig’s head terrine both demonstrate that offal has very much earned its place in the world of fine dining. Try Martin Wishart’s Pig’s trotter croutons for an intense meaty starter, or Pascal Aussignac’s Pig’s ears for a quirky canapé.